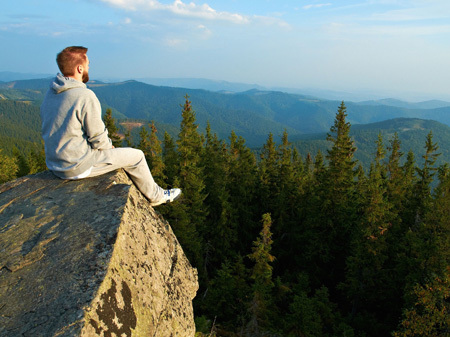 Natural Reserve “Gorgany” (Gorgany) – is a natural pattern untouched by human activity in central Ukrainian Carpathians. Contains the only in Europe and in the world array of European virgin pine. Reserve history dates back 1935, when the Metropolitan Sheptytsky founded the first Cedar Reserve “Gorhany”. September 12, 1996 by the Decree of President of Ukraine the nature reserve “Gorhany”, which consisted of landscape reserves of national importance “Giurgiu” and “Sadko” tracts “Chernik”, “Gnilyak”, “Novobudova”, “Elmy”, “Dovzhynets”, “Stoly”. In Gorgany most clearly manifested influence of Wiirm last ice age. This has left a mark on the morphological structure of the landscape and character of vegetation cover of nearly all altitudinal bands. In the highlands traces of glaciation centers of Arctic Alpine flora, and in the reserve forest area is protected only in Europe and the world an array of European virgin pine. Due to the great vulnerability of rare species of flora and fauna tours in the reserve are prohibited. It is possible to explore protected objects of the reserve only for scientific purposes and with the permission of Reserve management accompanied by senior officials. Tours in the reserve are prohibited. It is possible to explore protected objects of the reserve only for scientific purposes and with the permission of Reserve management accompanied by senior officials. For this were laid thematic trails with a total length of 38.4 km. They are of two types: vertical ecological and horizontal ecological. At first, one can observe the change of environmental conditions and vegetation, depending on the height above sea level, and the second - changing environmental conditions and vegetation, depending on the slope exposure and their swiftness. One of the most attractive is the thematic path “Polyenskyy slope” of length of 5 km and 20 points for joint that demonstrates mountainous landscapes, cedar, fir, spruce forests and thickets of pine. Also are laid thematic trails “Above the lake” and altitude typological profile “Giurgiu”. Tourist route to Mountain Synyachka (1402 m) – peak near Yaremche, which offers a panoramic view of the south-eastern Torhaniv, shows mountain hamsters, bruises, Dovbushanka, Small Horhan, Vedmezhyk and Ihrovets, and in the distance - and Goverlu Syvulya. Bunker of Thunder – the last bunker of UPA – historic monument of liberation UPA activities on the mountain Berezovachka in the stow Chernik near the village Zelena. Manyavsky skit – an ancient monastery of 17th c., founder of which as a native of Mount Athos monk Job Knyahynetskyy. Bear Museum, which was created to save the species of brown bears in the Carpathian Mountains in the village Manyava. Pnivskyy castle – one of the southernmost outposts defense of Galician lands of 16-17th c. According to legend, from the castle two tunnels ran: the first brought to the park in Center street, and the second - to Maniava skit. 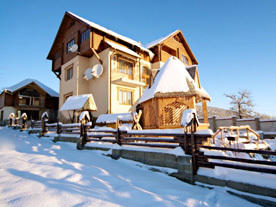 Gorgany Mountain Resort offers a comfortable stay with a wide range of rooms with views to Ukraine's highest mountain Goverla, skiing, sledding, snowboarding, outdoor restaurant with national cuisine, dancing at the disco, trips and recreation. 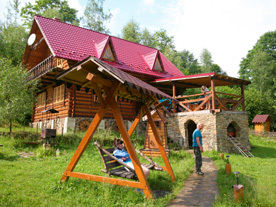 Manor “Zatishok” is a nice family vacation in the picturesque Carpathian village of Cernyk among untouched nature of Gorhany. Recreation Complex “Nebokray” is located on one of the higher points of Yaremche, near the forest, with a magnificent view of the city and surrounding area. 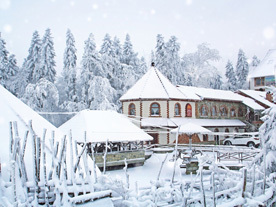 The sanatorium “Yaremche” is one of the health centers of Yaremche resort that blends with ancient Hutsul architecture. 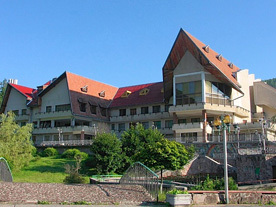 The resort hosted the cell with curative mineral water “Mirgorodska” and “Svaliava”. 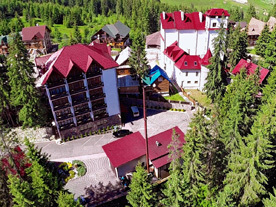 Entertainment complex “Gates of the Carpathians” with two-story restaurant with 3 rooms with signature dishes in the Ukrainian village Delyatyn. 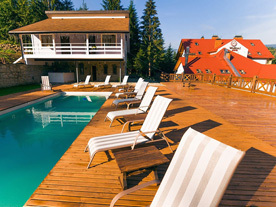 Hotel "Wellland" is an oasis of stylish vacation in Yaremche, which offers a peaceful retreat from the urban vanity. The flora of the reserve includes 459 species of vascular plants and 231 species of mosses. Much of the species are rare, endemic and relict. It counted 24 species of moss, which are rare for the Carpathians, and 10 species - rare for Ukraine. From herbaceous plants most often are found in the reserve: aconite strong, Carpathian buttercup, fiteuma Wagner, green tongue, Neottia nidus-avis, male orchis, Dactylorhiza sertsenosnyy. Wildlife of the Reserve is diverse and represented by typical species of the central part of the Ukrainian Carpathians. It is closely associated with high-altitude vegetation zones. In reserve was registered more than 1000 species of invertebrate and 209 vertebrate species. Among vertebrates are counted: 1 species cyclostomes, 12 species of fish, 9 species of amphibians, 6 species of reptiles, 136 species of birds and 45 species of mammals. Of these, 55 species are listed in the Red Book of Ukraine. From mountain vertebrate species constitute a specific set of boreal taiga, which are not registered in the surrounding areas. These include: the brown bear, red deer, snow fistula, povh (small water fistula), Carpathian squirrel, mole mountain valley, small Eurasian water shrew, Grey wagtail, alpine smoky, ring ouzel, three-toed woodpecker, Spotted nutcracker, White-backed woodpecker, capercaillie (in local gotur), fire-bellied toad mountain, spotted salamander, newt alpine trout stream (in the local trout) and others. Natural Reserve “Gorhany” is part of the rock mass and occupies Gorgan mountain ranges Dovbushanka and Polyenskyy. Overall Gorhany - is one of the least explored and most forested tracts in the Carpathians. Because of the steep slopes, stone deposits, dense primeval forests and thickets of wild pine Gorhany are called one of the least accessible parts of the Carpathians. Crests ridges and tops of these mountains are often covered with stone placers. In local dialect, these stones are called “hrehoty” or “gorhay”, which gave the name to this array. Stone deposits is a kind of business card Gorhany. With time at a stone begins to grow small green-brown moss and lichens, which gives the impression of a stone of extraterrestrial origin. 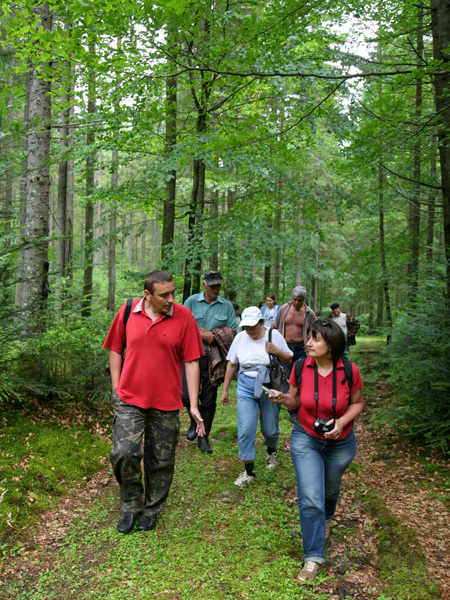 Natural Reserve “Gorgany” implements environmental and educational programs aimed at developing communication with local communities, forming an active role in the community and understanding of the purpose of the reserve and its functions. Reserve is eco-educational center, which conducts an active educational work among young people and the local population. Environmental advocacy - is holding discussions, lectures, tours, events, competitions, cooperation with the media, creating videos, publishing and distribution of brochures and leaflets, cooperation with schools district staff and students. At the reserve there is a museum of cedar and natural club “cedar”, which brought together writers, librarians, artists and naturalists and regularly conducts actions – “March of Parks”, “Commemorative Trees”, planting trees in city park, literary contests, competitions of ecopaintings among children. Students of Nadvirnyanska high school No4 held in reserve summer training practice living in the forest for a week, working on research areas and relax in the mountains. Within the reserve there is laid thematic path “Polyenskyy slope” with the length of 5 km and 20 observation points, which shows alpine landscapes, cedar, fir, spruce forests and thickets of mountain pine. The trail starts at after-forest Klyvky Berezovatski bows from which spectacular views of the tract Chernik open (top Goat Gorgan and Polyenskyy) and central Gorgany ranges - Syvulya (1818m), Vysoka (1805 m). On some points of the trail you can see the top (left to right): Steryshora (1723 m), Ruska (1650 m), Bratkivska (1792 m), Hropa (1763 m) and the Durnya (1709 m) and even Goverla (2061 m). In the forests you can come across traces of red deer, roe deer, wild boar, bear rare brown, rice. You can find hare, fox, squirrel and see birds: yellow black, three-toed woodpecker, crossbill spruce, spotted nutcracker, wood grouse (hotur), rock thrush, tree pipit. At the reserve there is eco-Christian school.